Two non-profits are receiving support through a friendly rivalry. 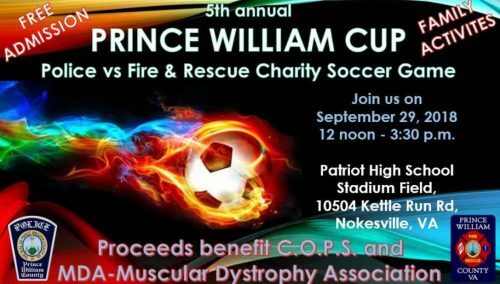 Prince William County Police Department (PWCPD) and the Prince William County Department of Fire and Rescue (PWCDFR) are competing in the fifth annual Prince William Cup. The charity soccer game will run from Noon to 3:30 p.m. on September 29. It will be held at Patriot High School in Nokesville. Proceeds from the game with benefit Concerns of Police Survivors (C.O.P.S.) and the Muscular Dystrophy Association (MDA). C.O.P.S. is a non-profit that seeks to support those impacted by line-of-duty death. The MDA is a non-profit that raises funds for muscular dystrophy research.